Nowadays your recordable DVDs and iPods allow you to store your favourite music and TV in whatever format you want. However in the pre-VHS era, if you wanted to enjoy your favourite TV show again, you either had to invest in a bulky, expensive reel-to-reel video recorder, or, rather easier, hold the microphone from your tape recorder to the telly speaker and make an audio recording. Inevitably you’d hear your sister shrieking in the background, but given the theme to Windmill was unlikely to make it onto seven inch, this was as good as it got. Similarly, if you couldn’t afford to buy your favourite current singles, Sunday teatimes would see you crouched over the radio, taping what you wanted off the Top Forty on Radio One. Inevitably this meant keeping your finger over the stop button, desperate to avoid getting any of the DJ’s voice on the tape – adding that extra sheen of professionalism. As any Musicians’ Union member would tell you, recording such copyrighted material was illegal, and clearly not to be encouraged. However in later years, the BBC managed to retrieve a substantial amount of stuff no longer in the archives, thanks to a home-taping amnesty. Sadly there was no call for low-quality copies of Shakin’ Stevens singles drowned out by your mum shouting you down for your tea. 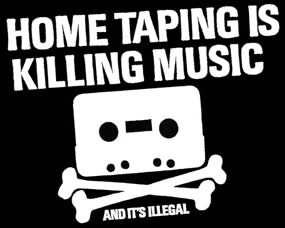 The MP3 format is killing home taping! I’ve still got a few tapes of top 40s, though I wasn’t brave enough to try pausing between songs. I managed to get Star Wars recorded off TV onto my tape teck (sound only, obviously) @ 1982 using my cousin’s headphone-out socket on their Ferguson TV. Had to lug a Marantz cassette deck to his house and all the way back. Next day, was playing it in mum’s kitchen when a temp resident builder who was installing our new Bathroom came in asking if we had a VCR as he could hear Star Wars going on in the background. Felt kinda cool doing that! 1. If the police ever raided your house and found taped BBC shows that had clearly not been wiped after two months, you were nicked. 2. Somebody has Bob Dylan Play for Today ‘The Madhouse’ on video. My older brother had a reel-to-reel and he often recorded selected tunes from Fluff Freeman’s Top 20 show. Whenever I hear Edison Lighthouse I can see those reels slowly turning. I got a radio/ cassette for my 14 th birthday and you don’t need a degree to find out what it was used for on Sundays. I wish I still had that top 40 tape as it had such gems as Don’t You Want Me( the best Christmas number one ever), I’ll Find My Way Home and, erm, The Land of Make Believe. Thankfully I have managed to acquire 100s of original recordings of the old chart shows but am always looking for more. I’m also writing a comprehensive book on the 5-7pm era, with playlists for every show, interviews with the DJs and producers, etc. There are certain shows I am still looking for like the 1979 Christmas chart (23 Dec 79 with Tony Blackburn), Richard Skinner’s final show on 23 March 1986 & the show from Jul 86 when the number 2 got played AFTER the number 1! Anyone that can help with recordings, info, etc. do please contact me at rmwhite021@gmail.com and I hope we can do some business.